Have you done a Clicker Challenge with your horse? Register today. Click here for more info and sign up. Join us, it will be two weeks of fun with your horse! One of the first Clicker Challenges I participated in myself turned out to be very useful and even saved me money on my vet bill a year later! That is what it’s all about: learning fundamentals in a fun and challenging way. One of the most fun tricks I ever taught Kyra is to pick up items. It is very versatile too because once your horse can pick up stuff, you can teach them to hand it over. Kyra can now pick up and hand over a flower, her food bowl, my clicker, a dog toy, a whip and anything else she can grab with her teeth. I started with something really easy to pick up for Kyra: a piece of cloth. In the beginning Kyra didn’t know what to do with it, so I knotted a carrot in it. That stimulated her interest. I clicked and reinforced for small steps like touching and sniffing the cloth, then examining it with her lips and after a while she tried to grab it with her teeth. Yeey: jackpot! This took a lot of sessions to be honest. Once she knew this new trick she wanted to grab everything off of the floor. That is the reason I started with an item that was easy to distinguish: the cloth. I didn’t want her to grab my brushes or other day-to-day items. Once she learned what to do with the cloth I added a cue to it, the verbal command ‘pick up’ with me pointing to the object I want her to pick up. After Kyra learned the cue I started teaching her to pick up other items. I bought a dog rope toy that is safe and easy to grab. Later on I practised with her empty food bowl, my gloves in winter, her halter, the lead rope and so on. It turned out that it is a very versatile exercise. Then I raised my criteria and I threw the item a step away. Now I only clicked and reinforced after picking up the item that was one step away. The next criterion was to move towards me one step with the item in her mouth. Then I taught her to hold the item until I could grab it. In this way she learned to put it in my hand instead of dropping it in front of me. Now Kyra can fetch an item that I have thrown several meters away and bring it back to me. One day I asked her to pick up her toy while sitting on her back. She did it! I use a treeless saddle, so I have to use a mounting block to get in the saddle.Wow, now I don’t have to dismount anymore whenever I drop something from the saddle. Bonus! This week I stumbled upon a lovely video of a horse that picked up three rubber rings and put them on a cone. I don’t have rubber rings, but I asked Kyra to put her toy in a bucket. That was fun too. Here are the videos of Kyra’s tricks. If you like the videos go to YouTube and subscribe to my channel. I will upload more clicker training videos. Get out of your normal routine and do something new and exciting with your horse this weekend. Here are some tips and tricks you can do. If your horse is already clicker savvy and knows basic behaviours like leading, standing still, targeting, follow a target, mat training and backing it is very easy to teach one of these simple tricks. Clicker trained horses are very eager to learn new things because in their experience there is a lot of good things (clicks and treats) involved. It is fun for your horse! Want to start clicker training? Start here. Basic behaviours: standing still while handler stands next to shoulder and targeting. Most horses like to be a bit taller and think this is a fun exercise once they have learned it. Mat training is a good basic skill to start with. Set your horse up for success and click and reinforce for every small step like approaching the pedestal, then investigating it and touching it with a hoof, et cetera. Raise your criteria slowly. Before you know it your horse wants to stand on the pedestal. Therefor it is equally important to teach him to backup and dismount it. Don’t forget to reinforce that, too. Keep the sessions short (5 minutes) and repeat over the weekend. Give your horse a short break in between the sessions. Make pictures or a video on Sunday to record your success. Please share your pictures with me on Facebook. Explore your surroundings and take your horse for a hand walk or hand grazing session. Read here how you can teach your horse to leave the grass voluntarily. Ask a friend to go with you. Do a photo session with your horse during the sunset. Hide a treat under a cone and teach your horse to find it. Have fun with your horse! If you have fun tips & tricks to share, please write them in the comment section. I am looking forward to hearing about your fun time with your horse. In my previous post What if your horse doesn’t like arena work I already mentioned that the first step is to find out the reason why. If you can exclude physical reasons like pain from the saddle, medical reasons like hoof cracks or maybe an unskillful (or rude) rider and so on, you can look for solutions to make your horse more happy in the arena. It is obvious: positive reinforcement (+R) of course. 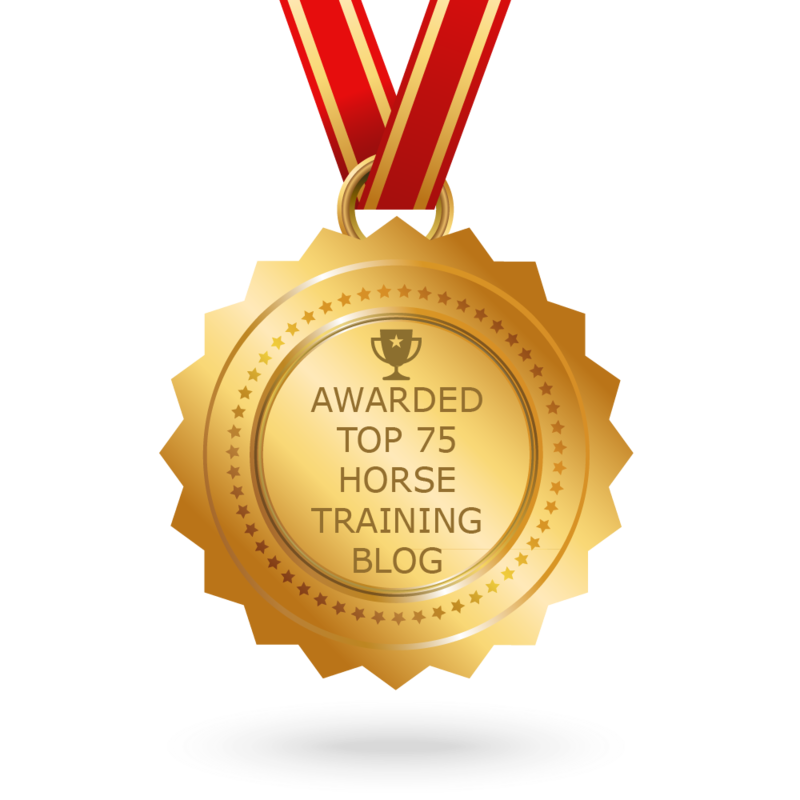 This way of training will make your horse more eager to work for you. With +R you will trigger your horses brain. He has to find out what made him earn that bridge signal (paired with a lovely reward). He will be challenged to think. Horses like that. Really they do! If your horse gets bored in the arena because everything you do is very predictable, try something new. If you always ride him, try some at liberty work, long reining or horse agility. Variety is the spice of life. Use more positive reinforcement to create a better association with the arena or ‘work’ he has to do. Change your Rate of Reinforcement, your treats or your exercises. Raise your criteria (slowly). Trick training is a lot of fun. Challenge your horse and do something crazy together like ‘101 things to do with a cardboard box’. You can bridge & reward him for every new exercise he comes up with: touch the box with his nose, left hoof, right hoof, kick it forward, play fetch with it, shake it and so on. Don’t bridge a second time for the same idea. Give him a ball (small or huge) to play with, or to wake his curiosity. Make sure he is not afraid of it. Don’t forget: there is a time to work and a time to play. Do nice relaxing activities in the arena. I like to let Kyra roll before we ride in the indoor arena on a rainy day (she loves rolling in hog fuel when she has a wet coat) or after our ride. If your horse likes to be groomed, groom him more often in the arena. Spend time scratching his favourite spots. Watch a video about TTouch or horse massage and try if your horse likes that. Feed him in the arena. If you have an outdoor arena where patches of grass grow, let him find them. So he can display his exploration behaviour. Don’t forget: it can take some time before a negative association changes into a positive one. Make haste slowly. What do you do to create variation or make the arena more appealing to your horse? Share it in the comments! For tailored positive reinforcement training advise, please visit my website and book a free intake consult!